I agree with the points that children don’t understand the levels and parents also do not understand the levels. However, my school has made us report instructional levels to the parents every single month. We are extending the assessment pressures to the home and disregarding the need for students to become readers. Teachers are working hard to help students become readers and assessment is really what is driving policy and instruction in the classroom. “Be brave enough to outgrow your best teaching””–I love this quote. I agree that we need to continuously look at our practice and ask why. This question about levelled texts is an important one. I believe there needs to be a BALANCE. I believe the levelled texts in the classroom have helped us be able to match emergent readers with simple, patterned text that isn’t necessarily readily available in the mass market, BUT, that being said there is so much more in helping students find just right books. I have seen over and over how student engagement plays a huge part in helping a student become a stronger reader who doesn’t just learn to read, but learns to enjoy reading. On the other hand, this shift in thinking requires a lot of direct teaching to help students CHOOSE text that aligns with their interests, purpose, and ability because research does say that every day students need to read text with a high level of success. As a literacy instructional support teacher, I would love teachers to move beyond describing their readers just by their reading level but instead by their reading habits, choices, and strengths. We need to keep in mind that our end goal isn’t to just teach children how to read but more importantly to enjoy reading. Thanks for this thought provoking article. I am facilitating a discussion on assessment in literacy this week. Your blog will be a good discussion starter. Excellent post! I’ve been questioning the levelling of classroom libraries since the year I spent hours doing mine. I too follow the F & P blog and was thrilled to see their thoughts were my beliefs. We teachers took something and ran with it and now it’s time to repair the damage I think!!!! YES!!!! This has been my heart’s cry for years!!! When I was a young one in the 60’s my mom encouraged our reading by a weekly trip to the library. Nothing was off limits. Fiction, non-fiction, children’s books, or those for teens or even adults… we chose what we were interested in. Mom’s guidance was supportive, but never oppressive… I taught my young son the same way, only was able to buy whatever books he was interested in….today, too much over analysis over the whole process and not enough READING! MHO! This is a great post and one I totally agree with. Ultimately we want our children choosing books that are a ‘good fit’ or ‘just right’ for them – that means they are taking into account readability and interest. Nothing pains me more than to hear a child identify themself as a reader by their level. Bravo. Thank you. I now don’t have to step on the soap box. I will simply share your well written post. Yes! This was the gist of a talk given by Mary Ehrenworth to some of our school district staff last spring. The emphasis on a teacher knowing students interests and reading goals, teaching them the joy of being a book stores reader. Teachers need to know the levels of books that the student wants to read in order to suggest books of similar style (etc.) that are at the child’s current level, as well as books/series that bridge a child’s current level and the books they desire to read. I had just been reading about this in The Daily 5, Second Edition. It talked about a boy who had gone to the library for the first time. The teacher was so excited for him and spoke to him about it. He said he couldn’t take out a book because there was no ‘red bin’ with his level text. It proceeded to give a process for kids to choose a just right book. Does it meet their interests, their needs, is it the right fit? I agree we need leveled texts, but kids need to read to love it and be lifelong readers. What a perfect (and timely) post! Thank you so much for this article. There is a heavy emphasis at my school on reading levels. I teach 2nd grade and have never felt quite right about telling a child to go put a book back because it is not on their level. I feel that when children are taught to choose good fit books, they will naturally gravitate towards those books they can read best. In addition, a child that wants to read a book a little too hard for them will find a reading buddy to help them with the words, or even read aloud to them if given the opportunity. One last thing, when I am reading aloud chapter books, in the past few years, children have begun checking out the same book from the library and then following along with me as I read without any prompting on my part. This has to be a great practice! Following the words as I read them fluently- awesome! Of course the book isn’t on their level, but the benefits are outstanding. New vocabulary, modeled fluency, a strong desire to read a more challenging text…Thank you again! This is a constant conversation. I’m so glad you took the time to share your thoughts. Leveled systems are to help us to choose books for instruction. Even with the leveled system, it is important that we know our readers as there is often a range of books students would be able to read from in instruction and depending upon our teaching point. We have to know our readers well enough to choose the books we want for instruction. I can have a D reader, for example, who is challenged by a particular C book or can read a particular E book with ease. It is helpful to be able to look at a book and determine in its supports and challenges before bringing a book to a reader or group of readers for instruction. Additionally, talking about students in levels can keep us from having real conversations about them as readers. I have worked hard over the years to be sure I am talking about the strengths and next steps of a reader instead of a level. This information helps readers, their parents, and other support teachers in supporting next steps. Teaching students to self-select text from a classroom library is an important step in growing readers. This takes a lot of conversation and time, but I’ve found students make the most progress when they can make these choices for themselves. Thank you for a great post! I have always conveyed to parents that one of my primary goals is that my students find a book that they love. One they are excited about and can’t wait to share with someone. I have seen many readers who work so hard at reading turn a corner when they discover the one book they get lost in. I am always sad to hear a teacher say to a student that they can’t have a certain book in their book box it is not their level. Like wise there could be a great benefit for an older student to continue reading picture books and even Mo Willems, but won’t because it might seem “babyish”. Such a great topic for continued conversation with colleagues. I see both sides! For many years, I taught 1st and 2nd graders about how to choose “just right books.” I taught it until I was blue in the face, but kids, (especially those who needed just right texts the most) would constantly reach for chapter books. SO much of my conferring time was eaten up by “Is this a just right book?” I would listen as kids struggled to decode or retell the texts, all because they wanted to read what the other kids were reading. So much of my teaching time went to finding just right books that I hardly had time to teach them at their independent level! I decided to make a change. I leveled about half of my library with colored dots. 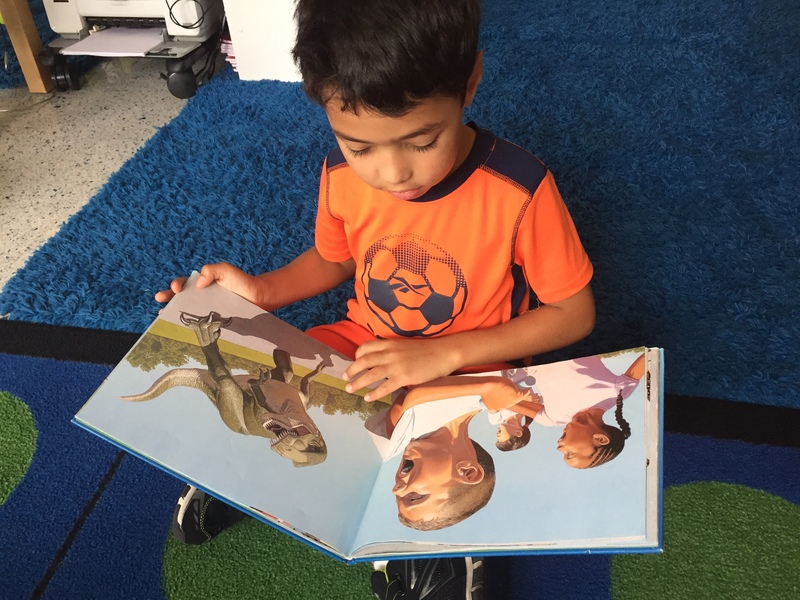 I have my students pick 6-8 leveled books each week and 2 “look books.” After Reader’s Workshop and during snack time, kids are allowed to read their look books, and bring them home for mom and dad to read to them. Kids don’t really know what the dots mean (they certainly don’t know their level letter), but they DO know they can read them without help and this is enormously powerful to developing self esteem in emergent readers! Even with the dots, I NEVER hear my kids say, “I’m a blue dot reader.” They are lovers of Elephant and Piggie, Henry and Mudge, Steve Jenkins, and more. I think it’s has more to do with your classroom culture and your language than with the organization of your library. We nurture reading identities throughout the day- through mini lessons, author studies, read alouds, reading conferences, etc. Later in the year, we categorize our leveled bins into character bins, genre bins, author bins, etc. I think you need to follow your head and your heart. For me, this method has allowed me to do a little bit of both! Well done. I agree entirely. Still trying to think of a reason for knowing one’s reading level. My district now requires us to put their reading levels on the report card each marking period. Parents have become focused on their children moving up through the levels rather than instilling a love of reading and helping their children read a variety of books that interest them.